this time she built up a deep knowledge on global cosmetics regulations with a special focus on UV filter regulations including nanomaterials. During the last years she has been a speaker on various occasions covering topics, like international cosmetics regulations, nanomaterials, UV filter, claims and traces. 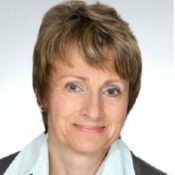 regulatory working groups of EFfCI (European Federation for Cosmetic Ingredients) and since 2006 she is Chairperson of the TEGEWA Working Group RAPS (Regulatory Affairs und Product Safety), the German counterpart of EFfCI.